What in the World is a site-specific project for the first edition of Philadelphia’s festival Philagrafika. The project is an “unauthorized biography” of the Museum of Archaeology and Anthropology of the University of Pennsylvania in Philadelphia, an illustrious institution that has played a key role in the history of American Archaeology. The project consists in an installation at the Penn Museum recreating the TV set of What in the World, a series of documentaries, and a published book digging out little known stories around the museum’s remarkable curators and other unusual figures of its history, all of which played a key role in shaping the museum’s collections. The project is inspired in a famous 1950s TV quiz show of the same title produced by the Penn Museum and conceived by its charismatic director Froelich Rainey. The program would bring together a panel of experts to try to guess the origins of a series of mysterious artifacts in the museum’s collection. What in the World was a pioneering museum education project during the dawn of the telecommunications age. The current project includes the launching of a season’s worth of episodes, loosely formatted in the original television show’s structure. The historical episodes examined as part of What in the World are the life stories of Maxwell Sommerville (1829-1924), professor at the University and collector of talismans and Buddhist items; Louis Shotridge (1882-1937), a Tlingit indian from Alaska who became a well known curator, ethnographer and controversial figure amongst his people; John Henry Haynes (1849- 1910) a photographer turned archaeologist who became the unlikely leader of the first American expedition to the Middle East and uncovered more than 20,000 cuneiform clay tablets in Nippur, loosing his mind in the process. Other stories include the mystery of the Julsrud collection, a group of clay figurines collected by the German businessman Waldemar Julsrud in Acámbaro, Guanajuato, Mexico during the 1940s and which include representations of dinosaurs, and the story behind the theft of a renowned crystal ball at the University Museum that once belonged to the Empress Dowager Cixi, the last female monarch of China. By creating an “ anecdotal archaeology” of sorts on this archaeology museum, the project addresses the social role of curators in museums and the skewed narratives that curatorial voices often project onto objects. An event on February 28th, with the participation of Mark Dion, will include a live recreation of a What in the World program as well as the launch of the What in the World book, publishe by Jorge Pinto Books. Throughout the twenty or so years I have worked in the education departments of art museums, I have gradually become interested the biographical anecdotes, oral histories and archived or nearly forgotten stories—most of which are seldom visible or communicated to the public—about the generations of collectors, directors, curators and educators whose vision and interests have shaped the nature and tone of their institutions as well as their collections. This book contains a small group of biographical divertimentos connected to a museum with a particularly remarkable trove of such stories. Most museums have a mission of educating through object-centered study, firm in the nineteenth-century belief that an object is a microcosm of a culture or an artwork a window to the world of an artist. What this focus often underplays is the fact that there are usually very subjective reasons—philosophical, personal, political—for the presence of an object or artwork at a particular museum, reasons why it was chosen by a particular person to represent a particular culture or art movement (or conversely, why certain objects or artworks are absent or not deemed important enough for inclusion). In other words, what is often missing when the story of an artifact is told is the history not of its maker but of those who brought it to the museum—the objects’ “curatorial parents”— as well as of those who gave philosophical life to the museum by creating the interpretive frameworks that envelop these objects. The histories of museums are best revealed not through the objects they contain but through the histories of the individuals that brought them there. The Hermitage Museum’s collection can’t be explained without Peter the Great in the same way that the histories of the Guggenheim, The Frick Collection or the Isabella Stewart Gardner Museum owe the peculiarities of their collections to their founders. But while founders usually leave their names at the door of the institution, the hand of its curators is more invisible, and most of them are forgotten after a generation or two. Sometimes this alternative history is unexceptional or irrelevant, sometimes it is unsavory or even embarrassing, but it often is useful and even illuminating, shedding light on the prevailing ideas and values of the time the collection was created. Of all American cities, Philadelphia has perhaps the most illustrious history in the early era of museum making. Pierre Eugene du Simitiere opened his coin collection to the public under the name American Museum in 1782 in Philadelphia, and a few years later Charles Willson Peale opened the first natural history museum (also the first major museum institution) in the United States there. As one of the historically key centers for science in America Philadelphia has a history of strange collections. In 1858 Dr. Thomas Dent Mütter donated his collection of medical oddities to the College of Physicians of Philadelphia, thus creating the still existing Mütter Museum. It is against this historical background that the University of Pennsylvania Museum of Archaeology and Anthropology emerged in the late nineteenth century. In the words of historian Steven Conn, the University Museum was “amongst the first institutions in this country—and probably the most ambitious—to create a separate space, both physically and intellectually, for the display of human artifacts apart from collections of natural history or specimens. Proposed by the University provost [William Pepper] as early as 1889, the University Museum, when it moved from temporary quarters to its new home in 1899, tried to do what the Peabody [Museum of Natural History, Yale University,] and the Field [Museum, Chicago,] had not yet done—occupy the space between science and art.” Aside from its central place in the history of American culture, the University Museum is a unique example of how individuals connected to a museum can leave a significant mark on the institution. The unusual cast of characters that formed the museum and helped give it shape during its first half-century of life run the gamut of eccentricity, ambition, idealism and even melodrama. Thus the University Museum is, I thought, an ideal candidate for such an examination of its personalities through its collection. Its galleries and its objects are a collection of two tales: the one of the ancient culture that the curators sought to tell, and the unintended story of themselves and their vision. That is the story that I find the most attractive, perhaps because having worked in museums for so many years I am too used to hear the behind the scenes curatorial stories that don’t usually become common knowledge. In the same way in which museums have two stories, this book also is a doubly subjective biography of the University Museum. On the one hand, it is an attempt to show how the personal interests and obsessions of certain individuals influenced the life of the museum; on the other hand it is my own subjective focus on a selected group of people that, to me, represent interesting aspects of curating, collecting, exhibiting and interpreting that are common to most museums. Seen through the prism of time, the subjects of these stories may appear naïve, egotistical and messianic. It is important to remember that the social and historical context in which they lived was drastically different from ours, and their efforts and accomplishments should be considered in relation to the realities they faced. The lives discussed here are remarkable, and they are worth remembering in connection to the objects they helped bring into public view. Steven Conn, Museums and American Intellectual Life, 1876–1926 (Chicago: University of Chicago Press, 1998), p. 83. It is a Tuesday night in April 1950. Rainey has recently become director of one of Philadelphia’s most illustrious institutions—the University of Pennsylvania Museum of Archaeology and Anthropology. The museum is only fifty years old, but it is considered to have one of the most important collections of archeological artifacts in the world. As director Rainey, follows the many charismatic figures who brought that collection together. It is time to prove himself, to bring the museum into the modern age. Froelich Gladstone Rainey was born in River Falls, Wisconsin, in 1907, and raised on a cattle ranch in Montana. He first thought he would be a cowboy but soon developed an interest in writing. In his memoirs he wrote, “The idea of becoming an anthropologist had not occurred to me. I had it all figured out that I was the writer the world had been waiting for. So off I sailed to get the background to fulfill my destiny.” The nation’s economy was crashing in 1929 as Rainey boarded a commercial steamer in San Francisco. In his travels he had many interesting experiences: selling ten-gallon tins of kerosene along roadsides in the Philippines, spending a night in a Cairo jail for carrying a gun, being stranded penniless in Shanghai and supporting himself for a while as a gambler in Monte Carlo. Upon his return, Rainey did a distinguished academic career, obtaining a bachelors degree from the University of Chicago and doctorates in English from the American School in France and in anthropology from Yale, where he had studied West Indian Archaeology and worked at the Yale Peabody Museum as assistant curator between 1935 and 1937. In addition, the hyperactive Rainey became the first professor of anthropology at the university of Alaska between 1935 and 1942. In 1944 Rainey joined the American Foreign Service and was assigned to the staff of the planned Allied Control Commission for Occupied Germany under Robert Daniel Murphy. He survived a brutal winter crossing of the North Atlantic, during which his convoy was savaged by storms and U-boat attacks, only to arrive in London as the first V-2 rocket bombs fell. After the war, Rainey would continue his relationship with the US government, commuting to Washington and working on the establishment of a branch of what would become the Central Intelligence Agency. But he wanted to go back to work in an academic environment. It was in 1947 that the opportunity of leading a museum in Philadelphia presented itself. The museum had experienced a hiatus during the war, and with many vacant positions, an operation deficit and an interim director it desperately needed new energy and vision. Rainey, then forty years old, was recommended from various sides. He had an impressive resume: on top of his international experience, he had the academic credentials. The museum’s board of trustees selected him enthusiastically. Rainey was a populist—“I have never been a dedicated scholar and disliked the label ‘intellectual,’” he wrote—and he was part of the first postwar generation of museum directors, which shared the belief that the education of the public is the civic role of the American museum. This democratized vision, plus an explosion of market-driven mass media, necessitated a change in the tone of museum scholarship. In 1948 the director of education of the University Museum, Eleanor Moore, had the idea to produce educational programs about the museum for television. She asked Rainey to participate in one of the programs, and he had an epiphany. Rainey had witnessed the emergence of television in his youth, and he understood its language. He thought, why not invest in a TV program with good production values and bring the venerable collection of the University Museum into people’s homes? No one before had exploited the visual capacity of television to describe and introduce museum objects. With a team of producers Rainey conceived of a loosely organized game show that would bring a panel of archaeology experts and other noted personalities together to examine a variety of ancient objects and determine their origins and the characteristics of the cultures that created them. Rainey would moderate the series. One can only imagine how such an idea must have been met by the conservative wing of the museum—the older, set-in-their-ways curators and keepers of the various collections. But Rainey was relentless, and in 1950 the first series of programs was created. An off-stage voice, which the panelists couldn’t hear but the audience could, introduced each one of the objects as it emerged on the screen through a curtain of dry-ice fog, accompanied by mysterious, exotic flute music. The panelists included celebrities and artists, along with curators of the University Museum (who weren’t necessarily at an advantage as many items were chosen from very diverse cultures and obscure areas of the museum’s holdings.) Viewers watched as they (usually) failed to pinpoint the exact period or culture to which the object belonged. Guests’ willingness risk such embarrassments speaks highly of their bravery and of Rainey’s persuasive powers. The program was a huge success. In 1951 What in the World won a Peabody Award, the most coveted prize in television, for its “superb blending of the academic and the entertaining.” Soon the program was broadcast to eighty-nine stations in the CBS network. Rainey received lots of fan mail, much of which is in the archives of the University Museum. It appears that, remarkably, he personally answered every letter. “We are happy to know that you enjoy the program as much as we have fun making it,” he wrote. What in the World continued to be popular, cycling on and off the air for almost two decades. Eventually, though, its basic production values were eclipsed by big-budget shows, and the series was brought to a close. But Rainey and the museum were remembered for the program for decades, and the museum continued to convene What in the World revivals every now and then, as part of benefits or special events, until 1975. Sixty or so years after the first broadcast of What in the World, it is a hot summer in Philadelphia, in 2009. I cross a plaza full of falafel carts at Thirty-fourth and Spruce Streets and arrive for the first time at the University Museum. I am here to develop an art project for the museum, and the goal of this visit is to find some direction for my research. Through a large gate is an open courtyard with a fountain and an agreeable group of trees. The architecture recalls the generation of Washington Irving, and Frederic Church’s Olanna—a fantasy combining a Moorish garden, a Romanesque church and an Italian palazzo. The architect was Wilson Eyre, Jr., who had taken a northern Italian Renaissance style as a departure point but had internationalized it, in keeping with much of the Victorian architecture of the time. The original project was incredibly ambitious: a group of buildings set in a nine-acre landscape, but construction stopped after thirty years, during the Great Depression. The engraving on the stone slab at the main entrance reads “Free Museum of Science and Art,” the original name of the museum, and is decorated with gatepost figures by Alexander Stirling Calder, the father of the famous twentieth-century American artist. I walk through the museum’s Kress entrance, part of a modern expansion in 1971. Styled like many other museum spaces of the 1970s, the space is flanked by two giant totem poles. A remarkably well-postured man with earrings and a silver bracelet comes to courteously welcome me. His name is Bill Wierzbowski, the keeper of the American collection. Bill takes me through the museum for the first time. We go up and down stairs and up again, opening and closing doors. The museum is a maze of corridors, and some hallways are partially lit. There are a number of closed galleries and a few exhibits in the middle of repair. We pass sphinxes, Babylonian artifacts, African costumes, Greek vases. There is no air conditioning in most of the galleries, and surrounded by the dimly lit Mayan stelae and other artifacts in the midsummer heat, I feel as if I am in a tomb. 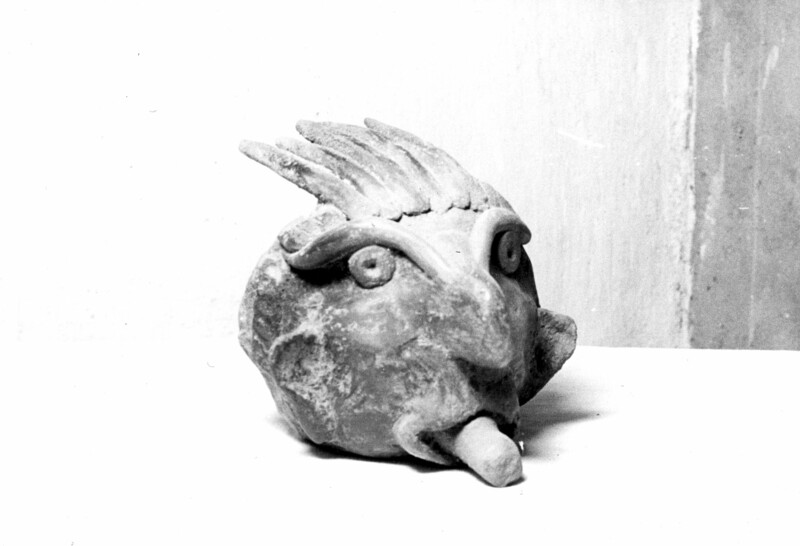 As in most archaeology museums, some of the cases appear to have been unaltered since the 1960s. Their light greens and blues, the fonts in which the texts are set and the style of the mountings are all reminiscent of another era of museology. The cases are time capsules, not of the cultures they ostensibly contain and depict but of the curatorial vision of those cultures at the time they were designed. In that sense, the museum is a dual encyclopedia, of both the cultures it studies and how those cultures were perceived by our curatorial ancestors. In modern and contemporary art museums, that phenomenon is almost impossible to find: it would be like walking into The Solomon R. Guggenheim Museum in New York to find galleries as they were originally installed by Hilla Rebay, or finding galleries at The Museum of Modern Art, New York, that remain untouched since the times of Alfred H. Barr, Jr.
We walk into the archives, where Alex Pezzati, the museum’s archivist for thirty years, is waiting. The archive room of the University Museum has the feel of a grand nineteenth-century university library. Two levels of dark oak shelves contain hundreds of gray archival boxes documenting the more than three hundred expeditions that have been financed by the museum as well as the papers of many generations of museum workers. Alex’s desk sits on top of a platform at the end of the room, supporting an old computer and piles of files. I have been told that Alex, who is in his late thirties, fulfills the role of institutional memory for the museum, bearing insider knowledge of the near infinitude of stories hidden in the archives as well as the oral history that has been transmitted by generations of museum staff, many of whom are deceased. Alex goes through the stories quickly, and they are so complex and intertwined that it is hard for me to get a handle on any of them. I leave the museum extremely stimulated but also intimidated. The New York Times dismissed What in the World as promoting a “stamp collector” mentality—equating knowledge to the ability to identify a given artifact. But others, like Dessart, defended Rainey’s project, saying that all education has to start somewhere, and that if the audience reached by this means was one that would have never been reached otherwise, that technique has a value. The range of reactions about the show then is similar to today’s ongoing debate in museum education concerning “edutainment”—whether entertainment is a useful vehicle for an educational experience, or if attempts to entertain obscure or obliterate educational value. The answer, I think, depends on an institution’s educational goals and what one means by “entertainment.” Although it is true that some may be entertained by reading Shakespeare or Cervantes, the more common assumption is that entertainment means adopting a vegetative state in front of a TV screen. In this sense, when entertainment is paired with education, the implication that knowledge can be obtained with no effort is a proposition that, to most of us, may sound like the educational equivalent to diet pills for weight loss without exercising: intellectual growth is rarely a purely leisurely process. But this doesn’t mean, conversely, that learning should be a dry and clinical process. Today, the term “engagement” is more favored in museums. The term describes an alert state of mind of someone who actively interacts with a particular reality in a way that is enticing as well as intellectually stimulating. What in the World was a detective game in which the solution to the mystery is the true story of the object. In the surviving episodes, the simple but clever process through which Rainey involved his audience is evident. 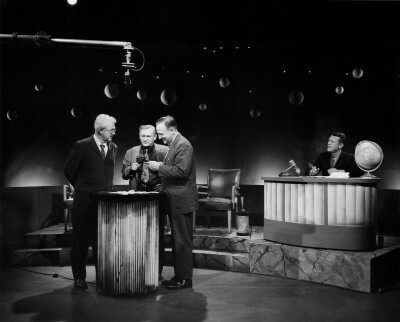 The game show was the format through which Rainey educated viewers in a key aspect of archaeology: that we often come to artifacts in darkness, with no knowledge of the story behind them. Through his quiz, he also reinforced a key idea in museology: that objects carry narratives. By many accounts What in the World introduced American audiences to archeology and to the main cultures of the world and even inspired some to study it formally. In my subsequent visits to the museum’s archives, I continued thinking about Rainey and his program, about his quest for opening the door of civilizations using a group of mysterious objects. Sitting in the middle of that large room I thought that some of these artifacts, put on the examination pedestal, could also tell the stories of those larger-than-life individuals, like Rainey, who had given life and purpose to the institution. And us today who are not archaeology specialists like those TV viewers, may yet be able to recognize the humanity in them; each object emerging from within the curtain of smoke, revealing the visions of those who are gone, those whose portraits hang on the walls of this museum but whose life stories lie underground like the objects they once uncovered. As a kid in Mexico, one of the first books that I ever knew that addressed ancient cultures was Anita Brenner’s Idols Behind Altars. In this museum I instead saw curators behind altars —curatorial biographies waiting to reemerge from within the collections of artifacts they once assembled, and who needed to be given the chance to speak again. Percy C. Madeira, Jr., Men in Search of Man (Philadelphia: University of Pennsylvania Press, 1964), p. 56.